The Calculator is perhaps the oldest of all traditional cell phone apps. It’s probably also the least confusing and frustrating Android app to use. The stock Android calculator app appears in the following figure. The version you see on your phone may look different, although the basic operation remains the same. 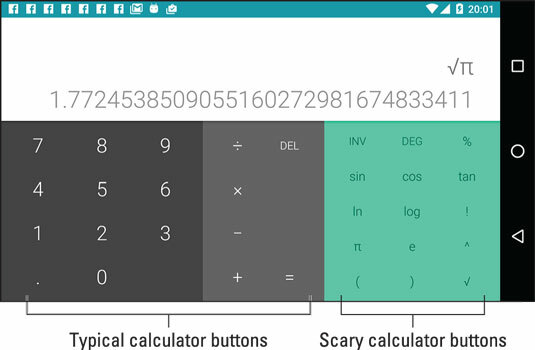 Also, consider changing the phone’s orientation to see more or fewer buttons; the image uses horizontal orientation, which shows the calculator’s more terrifying buttons. Tap the various buttons on the Calculator app screen to input your equation. Some buttons, such as the square root must come before you type a value, as illustrated in the figure. Use the parentheses to determine which part of a long equation gets calculated first. Long-press the calculator’s text (or results) to cut or copy the results. This trick may not work in every Calculator app. To clear the Calculator app display, long-press the DEL, CLR, or C button.